"We are going to reach the United States," declares one Erasmo Duarte, as he and a couple of thousand would-be Americanos hike northward through Mexico toward the Promised Land -- with scant appreciation, I'm afraid, for the non-welcome in store for them at the Rio Grande border and points west. The marchers say they're coming. Donald Trump says they ain't. That pretty much settles things to Trump's advantage, without settling the vexed issue of cross-border access in an age unsure how much nationalism in human affairs is just the right amount of nationalism. The last immigration moderate still standing in America proposes to weigh in on this great matter. That plenty of Hondurans might be sick of violence and poverty in Honduras is easy to see. The last-immigration-moderate-still-standing (hereafter, the "LIMSS") has gone on mission trips to Honduras. He sees their point. That you can't be allowed just to cross borders because you want to and wherever you want to should be equally easy to see. Why is it not? At least partly because of two admirable human emotions: pity and compassion. Nobody leaves a well-paying job and happy hearth to tread the path of the unwelcome stranger. Newcomers want a better life. Thus, pity and encouragement well up from Americans differently situated: well fed, well housed, well protected. In addition, with employment lower than in half a century, employers need more workers. Politicians, after the manner of their breed, have their own happy dreams: grateful, duly enfranchised newcomers electing them and their friends to Congress. Whereas refugees from political persecution normally find hospitality in free countries, self-election as a refugee, based on economic deprivation, is a non-starter. It has to be. Come one, come all -- the policy of the Honduran caravaners -- is unworkable, as anybody who gives the matter an instant's thought can plainly see. Jurisdictional boundaries -- a part of the structure of rules protecting life and civilization -- are a necessity. Any country enjoys the right to decide, generously or otherwise, who gets to live within its borders. Such is and always was the case, millennia before evolution and divine will -- or caprice -- gave us Trump. With Trump's off-the-wall image, the caravaners are playing games. They know he doesn't cotton to border-jumpers. They figure, nevertheless, that Democrats and liberal churchmen may put the full-court press on him, aided by social media and steaming commentary in The New York Times. 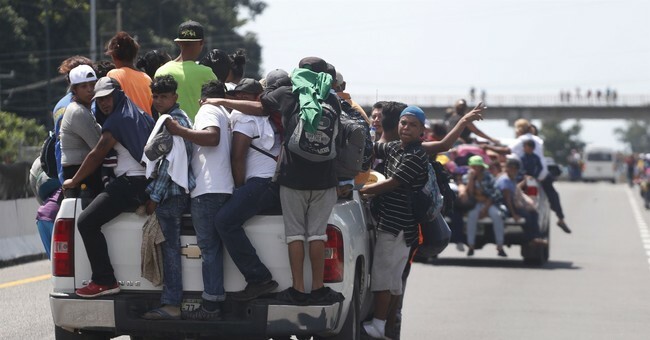 Whether admitted or repulsed at the border, the caravaners must see large gains. Their expectation may prove illusory, the LIMSS suggests. Americans barely know Honduras exists, far less that it's presently a mess. When Trump barks ultimately, "Alto! -- Halt!" that will take care of the matter; saving only the political cleanup from an affair helpful mainly to those who long for his impeachment and ouster. "Why, the big jerk! He hates the helpless!" Such is the political takeaway open borders advocates, here and south of the border, hope to manufacture -- to the general disadvantage, the LIMSS would add, of all who see the immigration wars as destructive and in grave need of settlement. Settlement is a commodity you don't get in the absence of unpressured discussion leading to unforced concession -- freighted, as lightly as possible, with demagoguery. There's always room in America for immigrants with needed and useful skills -- immigrants willing to play by ancient understandings that, with due room for the claims of justice, privilege a nation's own people over those from any other place. The ancient understandings were at one time taken for common sense -- artifacts of thought, to which you said, "Well, yeah. Sure. Of course." The of-courseness, the taken-for-grantedness of the straightforward and natural, isn't precisely a feature of today's philosophical landscape. So Trump should brace for more cries than ever of "How dare you defend our borders?! " His assumed willingness to dare may do much more for his prestige and influence than many expect, far less hope.